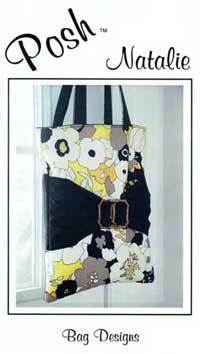 Tote style bag pattern by Posh (Jackie's Desighns) with a double shoulder strap. The front has a buckle embellishment and the band on the back of the bag is all pockets, perfect for holding long slender items like sun glasses. There are instructions for 2 additional pockets inside. Finished size is 12" x 15".